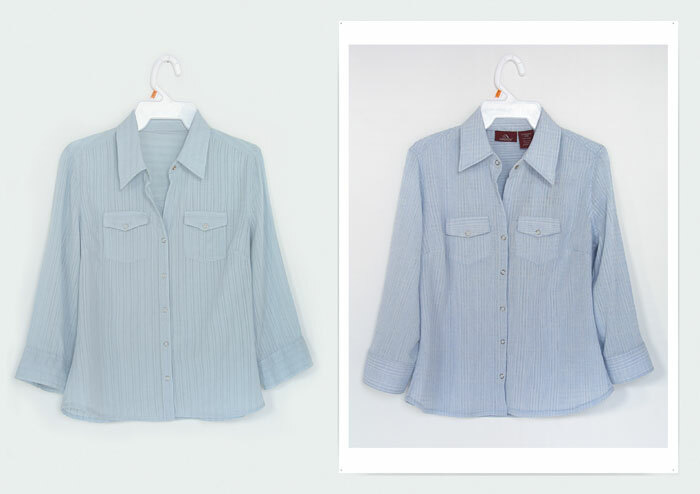 »Jordache ¾ Sleeve Snap Front Woven Shirt (Express Blue)« from 2003-4 by Zoë Sheehan Saldaña. Originally purchased on July 16, 2003 for $11.43 from the Wal-Mart store in Berlin, Vermont. The clothing was duplicated by hand, matching pattern, fabric and embellishments. The tags from the original item were sewn into the duplicate. The duplicate was returned to the rack in Wal-Mart for potential sale at $11.43.